NEW October 2006 Glutathione Anti-Aging Patch System That Removes Fine Lines And Wrinkles In 3-8 Weeks ! Now We Have For The First Time Ever, "Beauty From The Inside Out"
The Gear Guru", Patrick Netter, syndicated on national TV, The Daily Buzz who is seen in 121 markets by more than 50 million viewers a year, takes a deep, investigative look at LifeWave and sits down, for a one-on-one with LifeWave inventor, David Schmidt, President of LifeWave, Mike Collins, who was VP at a billion dollar company, PepsiCo, LifeWaves head medical researcher, Dr. Haltiwanger, 8 time NCAA Champion and Olympic Coach Champion, Richard Quick, and more. This DVD presentation is a compilation of what caused Patrick Netter to say; I have seen hot trends and I have seen hot products, but I personally felt what this technology can do. Dreamsenders.com and lifewave.com are not liable for any statement, omission, or misrepresentation in the web site. The statements herein have not been evaluated by the Food and Drug Administration. We certify that all LifeWave patches are manufactured at FDA registered facilities and in accordance with the specifications in our Patent filing. LifeWave, Dreamsenders.com does not endorse claims or have scientific proof that it's products are effective in the cure, mitigation, treatment or prevention of disease in man or animal. This product is not intended to be used in the treatment, prevention or cure of disease. Use product only as directed. Do not use product if you have a health condition. Please consult your healthcare professional before using should you have any concerns. The adhesive of our patches is hypoallergenic however if you experience a skin irritation simply discontinue use. Should any of the contents of the patches make contact with skin simply wash with water to remove. Should you experience any type of discomfort from the use of this product discontinue use. Please review all instructions and information about this product before using. 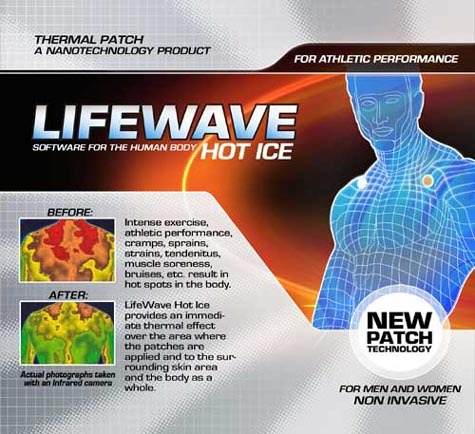 STORE LIFEWAVE ENERGY PATCHES IN A COOL DRY PLACE. To order product, or to find out more information, please contact the "LifeWave Authorized Distributor" who has contacted you or sent you to this web site. Please call Cekaitah at 1-250-859-8127 or Rich at 800-630-6575 and we will attempt to find the person you were speaking with.